WØEA Blog! : Part 4: The Finishing Touches - and Upgrades! Part 4: The Finishing Touches - and Upgrades! So far so good with the amp. It's been in service a week now and I have been able to really put it through its paces on a couple of bands. I finally decided to order an enclosure from Ten Tec. I chose one that is similar in size to the raw chassis that I was using as a makeshift enclosure. The new one is 9x9x4 (LxWxH) inches. That's 2 inches deeper an 2 inches taller, which by my measurements, should be a nice snug fit for all the filter boards and the keying board. Ten Tec enclosures are not the cheapest out there, but finding something this size for cheaper is really a crapshoot. The new enclosure has black top and sides and the end panels are what Ten Tec calls an eggshell white. Since my heatsink is raw aluminum, I went ahead and tore down the amp, removed the PA board and painted it a nice Rustoleum satin black. Apparently it is important to use a primer when painting aluminum so I did that first. It isn't a bad match and it will look nice on the desk for sure, though the Ten Tec case is more of a matte finish now that I have see it in person. It is pretty sad to go maim a brand new case but I need to mount the heatsink in the top of the case. A big hole. For this task, I chose my handy dandy rotary hand tool, aka Dremel, with a cutting wheel. As always, measure 30 times, cut once! 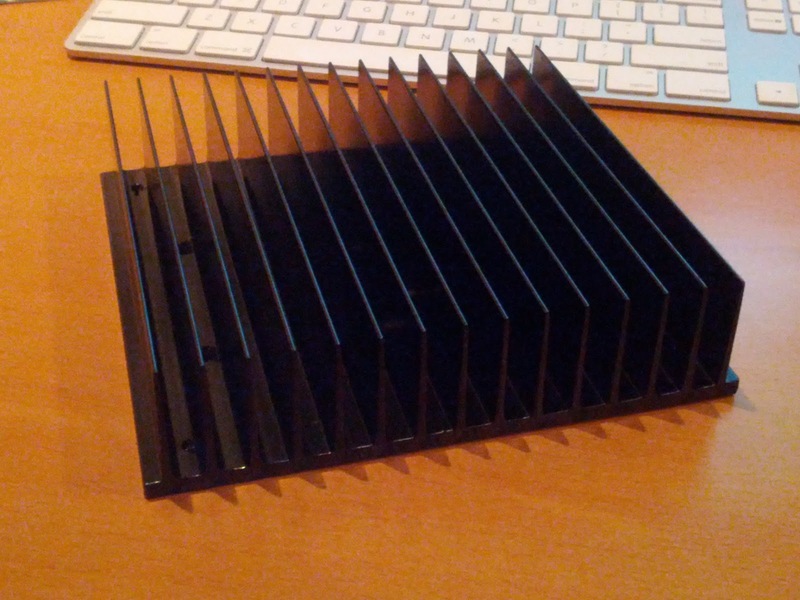 I went ahead and put the heatsink in the middle of the top cover and cut the whole just slightly bigger than the PA board itself. The heatsink was already tapped for screws so once the hole was cut, I marked and drilled the mounting holes too. I moved on to mounting the filters and keying board in the chassis next. Since each board is 2" wide, I had to stack one pair of them to fit the enclosure but I already had some threaded standoffs if you remember so that was easy. I lined all of them up in the case and marked and drilled those for 4-40 hardware. Next I worked on the front and back panels. I was really worried about screwing this up so there was a lot of measurement and test and fit and test and cut going on here! I also added a 25A circuit breaker to the power input for a bit of protection. Luckily I got the band switch I ordered from China on Monday so I could button this whole thing up. I went to town wiring up the filters to the switch, which was easier than I anticipated, but I did run out of coax so its only hooked up for 3 bands at the moment (40, 20, and 15). Now we get to the upgrades! As you have seen, I built the keying circuit using a simple, cheap, 12v relay. It has been working fine but I have really found myself seriously missing my QSK, especially when I'm not using the amp and have the break in delay set high. So, since I've come this far already, I decided now is the time to add that solid state TR switch. There are a couple of ways to build one but I looked for inspiration in obvious places - Elecraft's K2 schematics. A fellow QRP op pointed me to the website of G3VMW who just happened to have built a fully home brewed transceiver that used the same AN762 amp and utilized a modified solid state TR switch from the K2. I copied his design as provided, plus one additional cap, and built it up in Eagle. 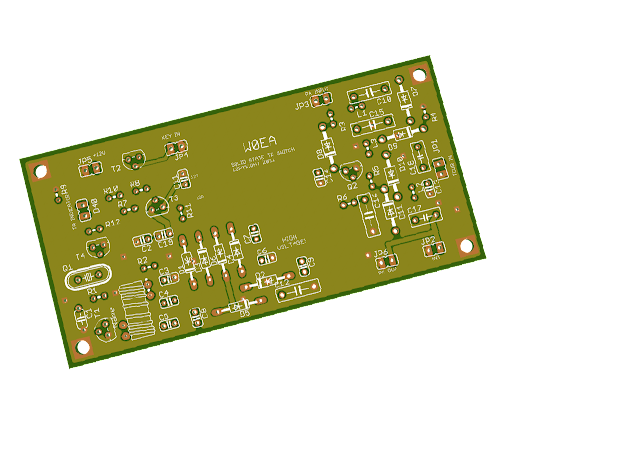 Yet again, with the help of my Norwegian friend, Thomas, we laid out a PCB and everything. I have always wanted to learn how to do that and once I got a hang of the tool, it actually became really rewarding, almost like putting a puzzle together. At any rate, here is the board we ended up with. I went with Seeed Studio for the board fab, mostly based on price. The other houses I looked at were 2 or 3 times more pricey Since Seeed is over in China, I'm not looking for boards for at least 3 weeks. Luckily I will be gone for nearly 2 weeks over the holidays so I couldn't play with any of that stuff if it were here anyway. After all is said and done and the parts for the TR switch are added up, I think the total cost of the switch comes out to not much more than the relay based switch, and if it works, totally worth every penny. So in preparation of the new switch, I just stuck the relay board to the case without any screws so I don't have any extra holes. Fantastic job, TJ! I've built an amp from CCI but it was nowhere near the quality of construction that you've accomplished here. I don't quite understand what you mean when you say you miss your QSK. Does the KX3 have the delay built in, but not the amp circuit, or is it the other way around? Do you want to have it switch faster, but it can't because it's a relay? Thanks for posting all this; I'll definitely be looking back at it as I build my 5w softrock amp. Good morning TJ, great job on the project and it's alway nice to see something you have planned and put together up and working. Oh and nice auto tuner I have the AT-200 and works great! Happy New Year and hope the Christmas season was nice for you and your family. Lookin' good TJ - and now you're officially a QRO op!